Change is the one constant in today's tumultuous business environment. A company's ability to adapt quickly to the shifting sands of the marketplace is critical to lasting success. Fail to keep pace with this change and you'll find your firm losing ground to your more adept competitors. While change is unavoidable in the marketplace, several forces are at work to avoid it in the workplace. People generally resist significant change, even when they understand it is necessary. They may agree to change initiatives in principle, but find it difficult to put change into practice. Old habits are hard to break. That's why leading change is one of the most important and challenging aspects of being a company leader. Chances are that your firm doesn't lack for good ideas, sound strategies, and market insight. The most crucial factor in your firm's continued success will not be strategy or smarts, but being able to make the needed changes to respond to an ever-changing world. 1. Create a sense of urgency. According to Kotter's research, the number one cause of unsuccessful corporate change efforts is the failure to establish an adequate sense of urgency. People are both (1) uncomfortable with most company changes that directly affect them and (2) prone to be complacent about the need for change. Successful change initiatives usually must start with establishing the compelling case for change. It is said that when the pain of change is greater than the pain of staying the same, change is highly unlikely. So the change leader needs to convince employees that the discomfort of change is a better alternative than maintaining the status quo. This is what I call "the Edict," a compelling reason to change lest you suffer more unwanted consequences. Best practice: When making the compelling case, don't just focus on why change is needed for the company. Personalize it to the extent practical. Describe how employees will be negatively impacted should the firm not make the change. Better yet, link the need for change to their current concerns and frustrations. People are much better able to make the transition when they see both personal impacts to be avoided and personal benefits to be gained. Common mistake: A management mandate is rarely as effective in establishing the Edict as an unpleasant or threatening situation. 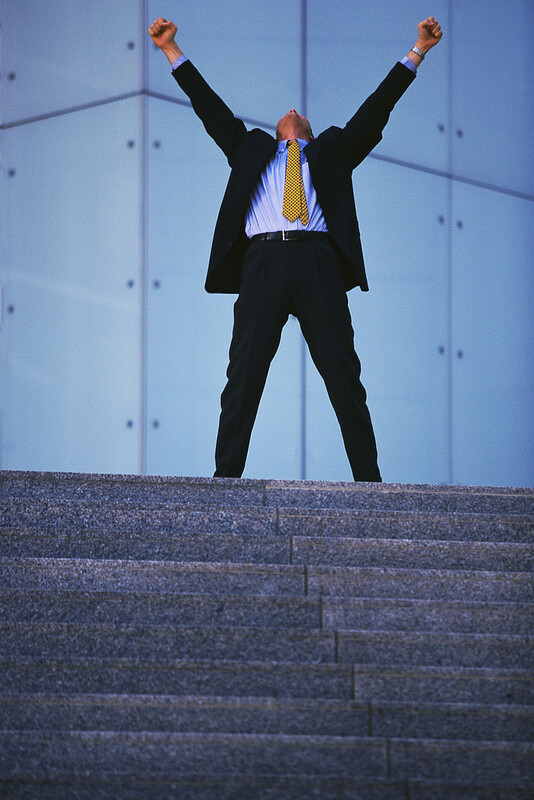 Use outside factors--the economy, market changes, client dissatisfaction, etc.--to motivate changes. You can also leverage your employees' unhappiness to propel change. Avoid the "do-this-because-I'm-the-boss" option as much as possible. 2. Communicate a unifying vision. If the Edict is the stick, vision is the carrot in gaining buy-in for change. Kotter describes vision as a "sensible and appealing picture of the future." It combines two elements: (1) a core ideology, linking to your values and convictions, and (2) a favorable envisioned future state or accomplishment. The strength of your vision depends in large part on both how well it connects to employee aspirations and how well you communicate it. That means that your communication needs to be two-way. Learn what your staff wants and find ways to connect this to your vision. Best practice: Before rolling out your vision to the whole group, test it with a sample of your employees. Ask for their feedback on how clear it is, how well it resonates with them, how it might be best to disseminate and reinforce it across the organization. You don't want to find your vision misses the mark after you've rolled it out. Common mistake: Message discipline and message diligence are common shortcomings. The first relates to a lack of consistency in how the vision is communicated firm wide. The second problem is a failure to communicate it often and broadly enough. If it's important, it should at least reach the frequency of other important messages (e.g., meeting utilization goals) in the organization. Take steps to promote conversation about the vision at all levels affected. 3. Get employees engaged. There's only so far a leader can drive change from the top. For it to be successful, it must be embraced and acted on by the people who must actually make the change happen. Leaders set the vision, but followers must implement it. Many a change initiative is derailed by the failure of company executives to understand the need to engage staff--rather than simply tell them what they must do--to accomplish the change. Best practice: Establish a representative implementation team to guide the work of change. Invite all employees to provide feedback and ideas to this team, so that all feel like they have a voice. This doesn't imply a democracy where majority rules, but empowering a group of people who are more familiar than company management with the work activities that need to be modified. Common mistake: When management dictates the specifics of how work must be done differently (e.g., a new QA/QC process), it's a recipe for failure. Management should determine what needs to achieved, but it's best to leave the details of how that will be accomplished to those who actually do the work. 4. Reinforce new behaviors. I suppose you could combine this step with the previous one, but it's crucial enough to warrant separate mention. As noted above, habits are hard to change. So you need to determine how you're going to promote the development of new habits and ways of doing things. Few company managers actually consider the psychology of behavior change, which is undoubtedly a key reason why most change efforts fall short. You can tell employees what to do differently and you might get good results initially. But to sustain those new behaviors over the long haul, you need to understand the role of consequences. When people, of their own volition, do something repeatedly, it's because that action produces a fairly consistent favorable result. It's self-rewarding. That consequence may be subtle, subjective, or even imaginary, but it motivates the continuation of the behavior. So if you're seeking to replace old behaviors with new ones that last, you'll need to effectively employ consequences that reinforce the change. The best approach is the use of positive reinforcement, something I've written about extensively in this space. You've no doubt heard the old adage, "what gets rewarded gets done." Unfortunately, most managers fail to understand what's really rewarding. Best practice: Be sure your efforts to use positive reinforcement to establish new behaviors meet the following criteria: (1) the reward is valued by the employee, (2) it is contingent on meeting specific objectives, (3) it is provided regularly, and (4) it immediately follows the desired behavior. You will notice that most of our attempts to incentivize behavior fail to meet all these criteria. Common mistake: Managers more commonly rely on negative reinforcement to influence behavior change. Negative reinforcement can be used to increase certain behavior, but there is a substantial qualitative difference. It produces compliant effort--doing the minimum--versus discretionary effort that goes beyond requirements. Positive reinforcement promotes discretionary effort, which is particularly important when implementing substantial change. 5. Anchor change in the corporate culture. The most pervasive influence on how things get done in a firm is culture. It has it's own inherent reinforcers, rewarding certain behaviors and discouraging others. Some aspects of corporate culture are formal and intentional, others have evolved without much conscious design. Culture defines the rules of conduct, which may or may not mirror what company leadership wants it to be. Any successful change initiative must be rooted in the culture for longevity. If the specific change is a bad fit for the culture, then the culture must be conformed to accommodate it. That's why trying to impose new rigor on work processes (e.g., how you manage projects) predictably comes up short in a loose, laissez-faire culture--a common occurrence in our industry. Best practice: Be sure to identify when your proposed change requires a corresponding change in the culture. Then include in your implementation plan steps to modify your culture as the change is being made. This may involve things like promoting new habits, eliminating old practices and systems, changing outward symbols such as terminology, logos, and rituals. Perhaps most importantly, actively promote conversation and stories that reinforce the key cultural attributes that you are seeking. Common mistake: I frequently encounter situations where strategy doesn't align with culture. One or the other simply has to give to make a successful change. It's easier to tailor your change initiative to your culture, but most often the change is in fact necessitated by cultural deficiencies. So cultural modification is usually a critical part of any corporate change effort. 6. Lead by example. The strength of a leader is determined by his or her ability to influence others to follow. That depends on what is often called "personal power," the leader's character and skill that draws people to follow without having to regularly resort to positional authority. There is nothing more important in establishing personal power than integrity. Integrity can be defined as demonstrating consistency between what you espouse and what you do. When a leader promotes a particular change effort and then acts in ways contrary to its objectives, integrity is compromised. To some degree, it is the leader's integrity that is brought into question. But assuming that individual is reasonably respected by his colleagues, it is likely that the integrity of the change vision that has been damaged more. In the many change initiatives that I have been part of, there has been no greater cause of failure than firm leaders undermining the change by their example. Usually this is evidenced in having too little commitment to see the change through, or allowing other priorities to effectively usurp the change. 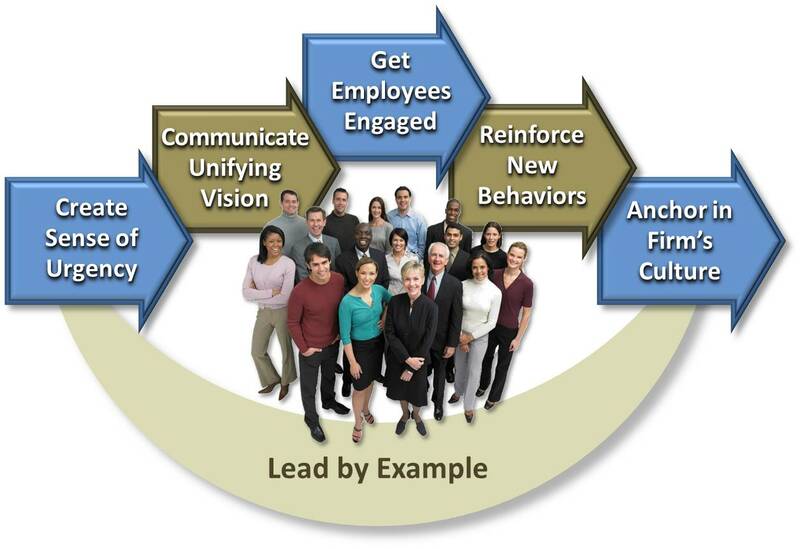 The point is: Employees will look to their leaders to assess the real credibility of the purported change initiative. Best practice: Set the pace by your active involvement in the change effort. If you're not involved in the details of implementation, at least stay informed and visible. Remember, if it's not worth your time and attention, others are likely to make the same determination. Common mistake: Beware of allowing more urgent matters to distract you from leading the change effort you committed to. Change takes time, which makes it vulnerable to the constantly shifting priorities dictated, not by importance, but by urgency. This is where the dependable focus of an effective leader is needed for success.